Morning Routines That Really Work for Pre-K and Kindergarten! A few weeks ago, a teacher asked me to describe my morning routine, and this is a question that is asked of me from time to time. And while I have posted my daily schedule, I have not really described very well how I get my class started each morning. So this blog post will tell you how I generally PLAN on starting off each day- not that every single day goes as planned, of course! You never really know what is going to happen each day when you open up the door to all of your little sweeties, do you? That is the wonder of teaching; each day is filled with new challenges that are similar in nature but still entirely new and keep you thinking on your feet every minute of every day. It’s an exhausting, but wonderful job! 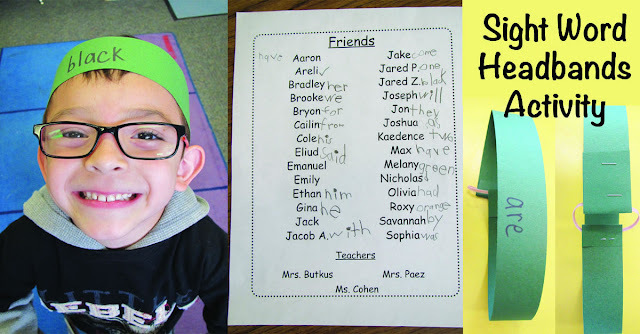 AND… I am so happy to tell you that Krista in the HeidiSongs office has been working very hard this week and has already completed the second set of Hidden Sight Word Worksheets! 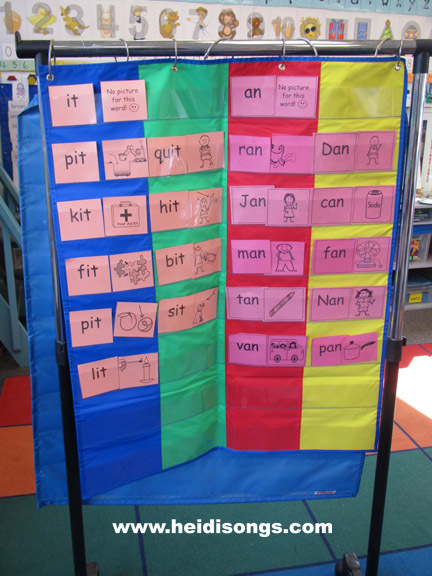 This set includes worksheets for all of the words that are on Sing and Spell Vol. 2, which are: red, orange, yellow, green, blue, purple, brown, black, white, gray, pink, an, at, big, do, down, has, in, it, no, not, small, this, too, up, we, what, who, yes. Click here to download a couple of free samples from this set. Click here to purchase the set from our website. 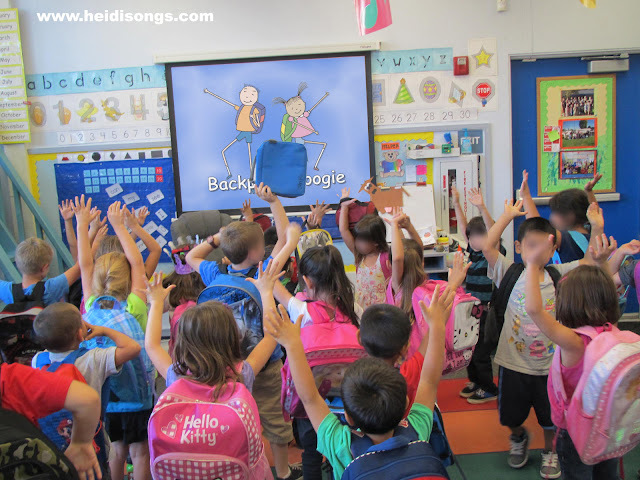 I am so glad that this year, I was able to START the school year off using the Classroom Management CD/DVD right from the beginning, especially since I was able use it to teach and review the rules of my class using the “Follow the Rules” song! I taught it as soon as I could possibly squeeze it into the day during the first week of school, and then reviewed it as often as possible, circumstances permitting. When I first introduced the Backpack Boogie, we did it at the end of the day with our backpacks on, just for fun. Then they were ready for it the next morning when the song came on as they came in the room. Boogie right through the day! And if there’s any homework, pop it in: ka-zing! And boogie right through the day! I say good-bye with a smile. I’m going to greet my teacher as I walk through the door! And I know my things don’t belong on the floor! And I’ll boogie right through the day! I made a new playlist on my iPod so that the “Backpack Boogie” comes first, and the “Follow the Rules” song (also from the Classroom Management CD/DVD) comes next on what I call my “Morning Routine” playlist. My rule is that the children have to have everything put away and join us by the time that these two songs are finished. Otherwise, they have to go to time out. But they know the rules, and this rarely happens. Plus, my aide is back by the cubbies and reminds them to keep moving when necessary, so there is rarely a problem with dawdling (at least this year!) Last year, I had a child that deliberately dawdled through this routine every single morning (no matter what,) and I had to deal with him in a different way. We finally got to the point in which he would make up his wasted time by sitting out those minutes at recess, which was the only thing he really responded to, unfortunately. After we have sung both the Backpack Boogie and the Follow the Rules songs, I have everyone sit down by counting “One, two, three!” and showing my fingers as I count. This is my daily signal for them to sit down, no matter what. I really like using this, because even if it is pretty noisy in the room, if I call out, “One, two, three!” and also show my fingers as I count, most of them will respond by instantly jumping and sitting down criss cross applesauce in their spots on my colored carpet. Once the other children who may not have heard me or noticed what I did or see the other others sit, then they join them. It’s an efficient way of getting control back of an excited group of children. After that, I take roll by asking each child if they are bringing or buying their lunch. So instead of saying “Here!” or “Present,” they respond with “Bringing!” or “Buying!” and then I have my cafeteria lunch count taken as well as attendance. 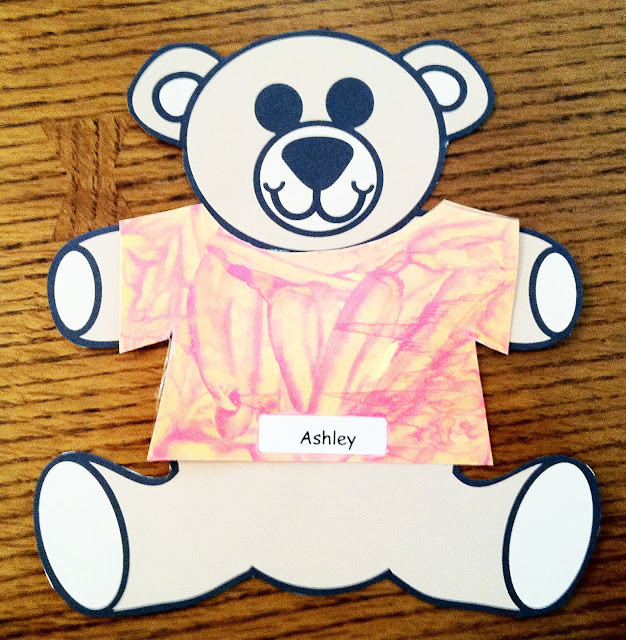 At that point, I choose a helper for the day by selecting a new shirt for the Helper Bear and have the helper take my attendance sheet to my aide. This is a free download on my blog. Click here to find it! Then everyone stands up to do the “Right Hand, Left Hand” song while the helper delivers the sheet and gets out the flag. 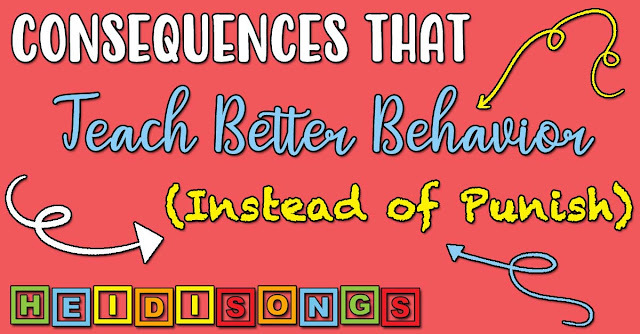 (All of the songs in this post are from the Classroom Management DVD, except those noted differently!) Since that song ends with “Put your hand on your heart, and face the flag please,” it provides a natural segue right into the flag salute. I quickly pause my iPod, (which is conveniently placed right at the front of the room, naturally!) and then we all do the flag salute. For some reason, I always tend to have kids that want to goof off during the flag salute, so I have to keep a sharp eye on them while we do this. I have no idea why this is the case, but it seems to happen every year. Does this happen to anyone else? An A, B, C, pattern just for you! Of course we march while we sing, so it is a good way to get that oxygen flowing to the brain as well! You can see the iPod circled in the lower right corner. It’s right up front next to our art project for the day that is set up for me to demonstrate. When I leave for the day, I have everything set up for the next day before I go home. Once the kids are seated nicely, I just keep letting the iPod play, and grab my pointer. There is just enough time to ask them what the month is and let them all respond. Then the “Days of the Week” song starts. They all sing it while seated, so it works out nicely. After that, my playlist goes to the “Months of the Year” song. I don’t sing that one every single day, because sometimes I know that we will not have enough time. On those days, I just pause the iPod and forward the iPad past it. While we are up, we also sing the Count By Tens Song from Musical Math, but later in the year, we might skip that one and sing the Count by Five’s or by Two’s song instead. Again, if we are pressed for time, we may skip these. But once I have everyone standing, and the song is cued up, it’s really only takes less than a minute to just go ahead and do it! After that, I count to three again and everyone sits down again. Then I add one more straw to our place value chart so that we are counting every single day that we have been in school so far. We put those straws in bundles of tens and count them by tens- sloooooowwwwwly this time, (and I point out that we are using what we learned in that song we just sang-) and then add on the “one’s” that are not in the bundles to figure out how many we have altogether. 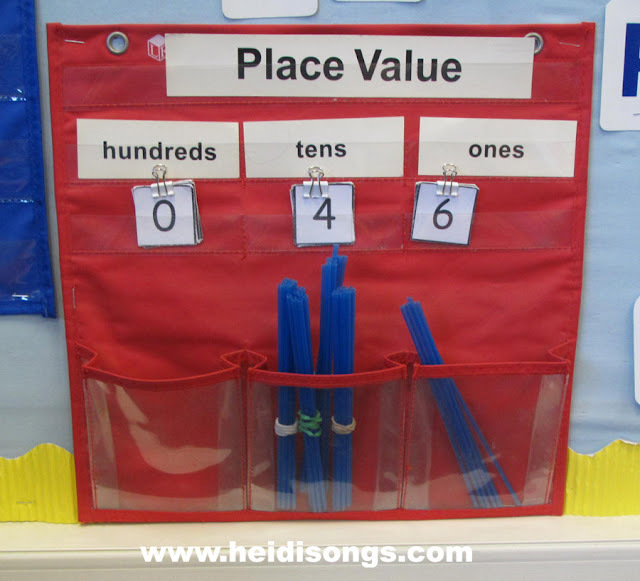 This is my place value chart. The coffee stirrers are bundled in groups of ten with rubber bands. Then we add that number to our hundreds chart. I like to make our numbers that are multiples of five and ten a different color than the rest, if possible. 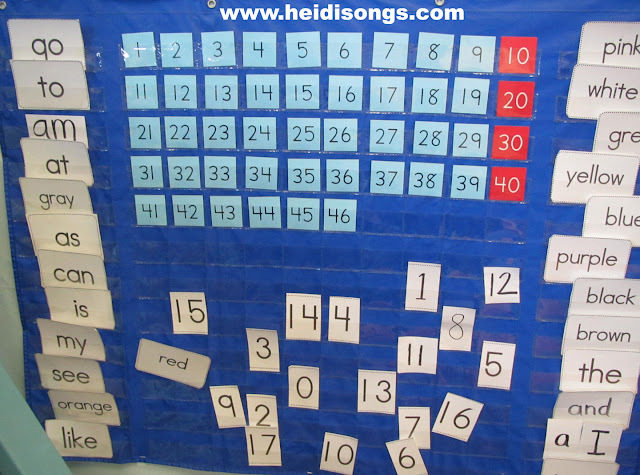 This helps kids notice the patterns that are going to emerge on the chart as we go along. Later in the year, I can show them the patterns that form when you count by two’s, but I usually do it on a different chart. Otherwise, there is too much happening on the hundreds chart and it gets too confusing for them to really notice the patterns. My hundreds pocket chart has lots of space for extra words on the sides. It’s time to take the other numbers off of the bottom though, I think! We have been drilling on them, and there is nowhere else to put them! Reviewing Concepts Stapled to the Bulletin Board by the Calendar At this point, assuming that there is time, I review the words or letters stapled to the bulletin board around the calendar and the hundreds chart. I like to call this my “Focus Wall.” My job share partner is very good about remembering each Friday afternoon to add the new sight words, shapes, numbers, etc., that we need to focus on the following week to the wall. She is actually much better about remembering than I ever was, so that’s great! I often only remembered it when I arrived on Monday morning, unfortunately! 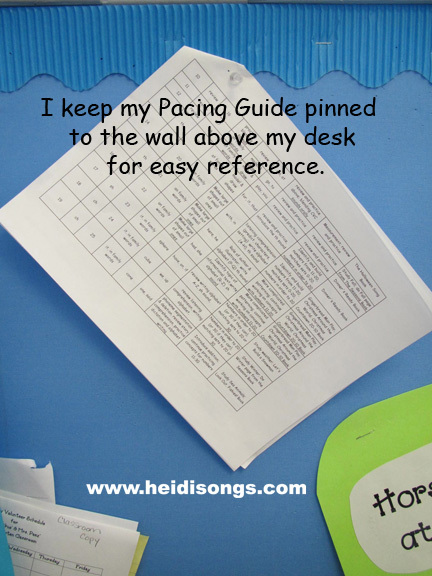 We have my Kindergarten Pacing Guide tacked to the wall above our desk, and she just gets it out and finds the flash cards for the week and adds them to the wall. I think that it is probably time to take a few of the cards off the wall though, because we are running out of room. Plus, there really isn’t time to review them all every day anyway. This is my Pacing Guide. Click here to download it free. This is also the time of day when I review the CVC flash cards (from the CVC Books) on my pocket chart. But if it seems like we are running out of time, then I save that for after lunch. 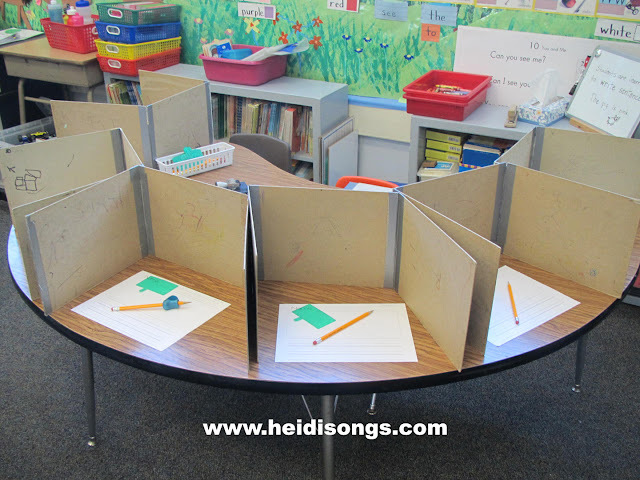 Explain and Demonstrate the Art Project Since we do our morning rotation in four different groups, I like to give the directions for our centers to everyone at the same time before they go to their centers. So I demonstrate the art project to everyone at this point, even if it means they get the instructions an hour before they do it! There will be a volunteer at that center to remind them what to do later anyway. And as I trace, we sing the “Tracing Song,” which is the next song on my playlist. After that comes the “Scissors Song,” which we all sing while I cut. Then of course, the “Glue Song” is sung while I glue. All three of these songs are sung while seated, of course! I often sing them without using the iPod; I just start singing and the children join in. If the song ends and I am still cutting or gluing, then I just start in singing the Red Song if I am cutting red paper, for example, or the Blue Song if I am cutting blue paper, etc. (Both of these color songs are from Sing and Spell Vol. 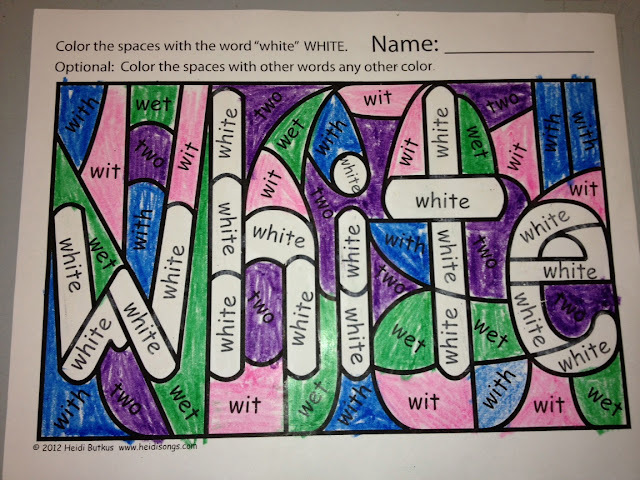 2: Color Words and More Sight Words.) I REALLY recommend keeping your students engaged by allowing them to sing along with you while you demonstrate how to make arts and crafts projects. It’s a wonderful way to keep students focused and alert. I also have them repeat back to me what they are supposed to do to make the project when we are finished, and then also tell a person next to them how to make that project. 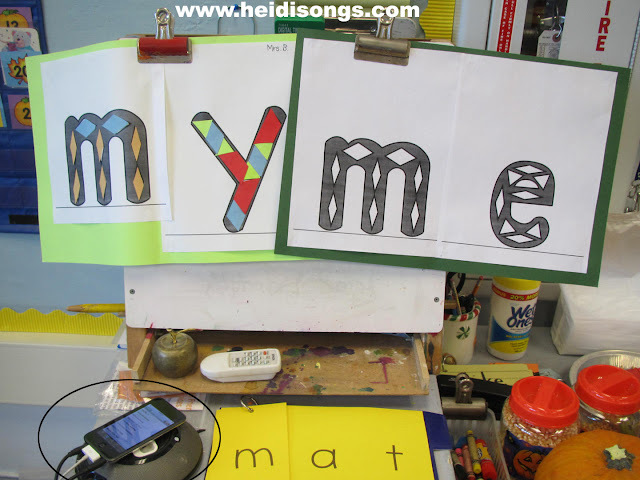 We made sight words with our Alphabet Pattern Blocks this week. When I am ready to get their attention back, I tell them, “Now I need it very quiet in five, four, three, two, one.” I like this method of getting them to finish a conversation and be quiet, because it gives them a little bit of warning to finish up what they wanted to say before I ask for their full attention and silence again. I try to be very consistent with disciplining anyone who ignores me and keeps talking with a friend when I get to number one; otherwise, next time I want to use this method to get them to be quiet, it will not work, unfortunately. Every teacher needs to understand that the person that gets to decide what methods are going to work or not work in the classroom is the teacher. The children will likely respond to whatever rules you enforce with consistency. But they will challenge you on the rules that you enforce sporadically. If the children are getting restless, you may need to stand them up and sing another active song or two or three at this point! Mine needed yet another movement break during the first month of school, but are able to go a bit longer now that it’s November. In any case, if there is more that needs to be explained for our centers for the day, I explain it now. We had to take a writing test at one of our centers last week! After I have explained all of our activities that we will do during our rotation, we do our Morning Message. But I am going to be honest with you and tell you that depending on how the morning goes, sometimes the Morning Message becomes an Afternoon Message that we do after lunch! For example, if somebody has an accident, a child has a “meltdown,” or if my aide comes late, or if it is Picture Day, or if there is a Fire Drill, or if a parent walks in and just HAS to talk to me… well, you get the idea! In those cases, SOMETHING has to go! I can skip any one of those songs and shorten up any of the previous activities. And if the children simply can’t sit any longer, then we can put off our morning message until later. And SOMETIMES- lo and behold- things go even FASTER than usual and I even get to read a short book in the morning as well! Then we really have something to write about for our morning message! This was our morning message the day before Halloween. When I do our Morning Message, I have the whole class turn to face my white board easel. That means that everyone is turning around so that the kids at the back are now at the front! Some of my little ones cannot handle this, and I have to move them closer to me for this activity, unfortunately. Otherwise, the lack of proximity to me means that they simply pay no attention to me at all while I do this important activity. And, anyone with vision or hearing issues must also be moved closer as well. To do the Morning Message, I pull a sentence or two out of my head regarding something that is happening that day. It could be about a child’s birthday, the art project, something we are studying, or even a fund raiser that we are all working on. It really doesn’t matter. I have the whole class settle on a sentence to write, and we all say it together. Then we decide what the first word is. 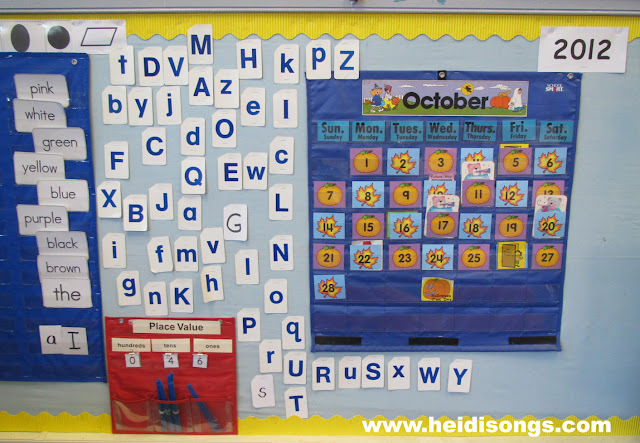 If it is on the word wall, then I pick a child to find it with my pointer while we sing that sight word song. (I lead them in it from memory with no CD.) Then I pretend to copy it from the wall while the child points to the letters. Then we figure out what the next word would be, and either sound it out together or find it on the word wall. I write those “unknown” words as they sound, and that means that I usually wind up writing them incorrectly in front of the children! I hate that, but it seems that if I spell them correctly, they all think that THEY must also spell them correctly, and they can’t. So I have been trying to overcome my compulsion to spell everything correctly in front of them so that they will let go of their fear of writing something wrong when using phonetic spelling. It seems to be helping! 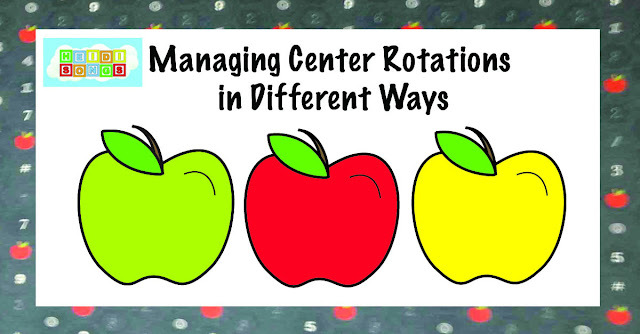 If you would like to read more about how I do my morning rotation, please click here to read my blog post on that topic. And if you made it all the way to the end of this very long post, then good for you! If you have any questions, I would be happy to answer them. Just let me know what they are. Who knows; maybe they will make a good future blog post???? Just curious: how many teachers out there still give students a snack at some point during the day? How do you work it into your routine? 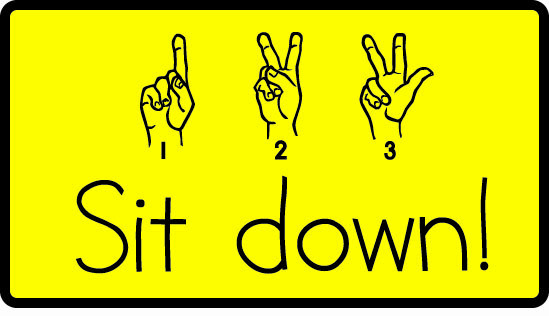 I like your "1,2,3 sit" signal. It seems like a relatively easy way to get their attention. Thanks for the tip! The children can bring a snack from home if they wish, and they eat it at recess. Recess comes half way through their morning rotation, at about 9:50. Most of the children do bring something from home. I encourage parents to send just one item, otherwise the children wind up spending most of their playtime at recess eating, and they also need to run around and burn off some energy. I do have trouble with students being disrespectful during the Pledge. At first they got warnings...now they have to move their clips down on the behavior chart. We have snack in the afternoon. I send home a Snack Calendar each month assigning a snack day (or two, depending on the month) to each child. Most students bring in snack on their day, but I keep all extras in a storage drawer, because sometimes people forget. The kids love the days they get to chose their snack from the drawer. Thank you for the great post! I was wondering where you got your big 100's chart with room to put words and numbers? I only can find the one that has the tiny numbers on it. Thank you! ariI have snack in the afternoon and that is when I do my math centers, so I try to work the snack into the skills I am covering. 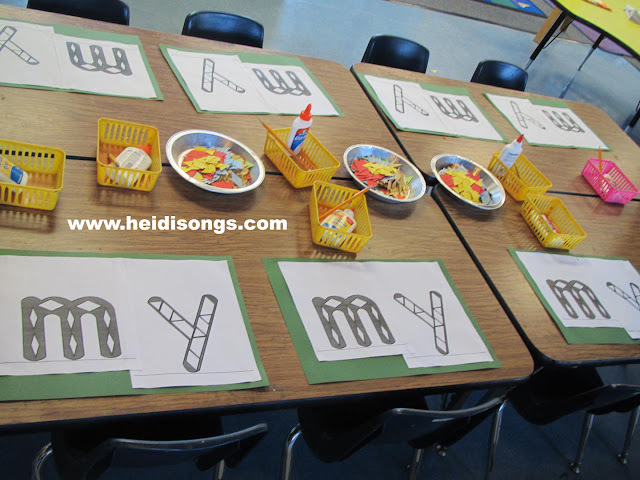 I use songs like "We're Eating to Zero" or we make patterns, focus on shapes, position words, etc. I send a letter each Friday asking specific parents to send a snack of my choice like Goldfish, Teddy Grahams, pre-cut pieces of fruit, shape crackers, etc. I THINK I got the hundred's chart from ReallyGoodStuff.com. But I've never seen that chart on their website since... It could be that it was discontinued. I think it was called "100 and Beyond" Pocket Chart or something like that. It allows you to count all the way up to 120 with the kids. I've been using your "Right hand, Left hand" song before the pledge all year and it's been great! I really see a difference in my kids' right/left hand knowledge. 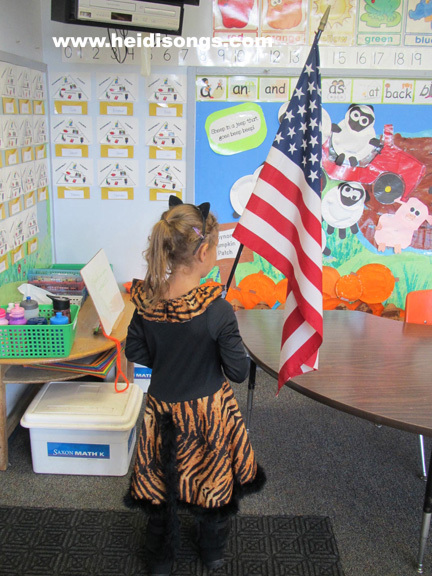 I saw right away that my kids were also getting squirmy during the pledge- so I started doing each line in a different silly voice, which I have them repeat after me. It does feel a bit disrespectful, but it works! They are totally at attention to see what will come out of my mouth next, and they are so excited to try it themselves. I was surfing around stumbleupon.com. It looks as though someone loved your site so much they decided to bookmark it. I'll absolutely be coming back here more often. How long is your Pre-K day. I really like the ideas for your routine, but I have a 3 hr class time with students who often don't show up until 30 min. into our day (the parents think it is day care I think) Any suggestions on how to get the day started on time? I currently have centers for 30 minutes at the start of then day then start with circle. How would you deal with parents who treat your class more like a day care (showing up whenever they want usually at least 30 min late)? It makes it difficult for me to start my day on time since late arrivals cause a big disruption. I have a 3 hr pre-k class. Well, since I work in a public school, the routines are different since attendance is required! Late students must check in through the office, which at our school is a considerable distance away. So the first thing I do is immediately tell the parents that they must walk the child to the office and check him or her in there. This is the school rule, but also is very inconvenient for the parent and usually makes them even later for work. Unfortunately, sometimes, the key is to make it worse for the parent to be late than early! It acts as a deterrent for the parent. Also, excessive tardies result in a letter home from the principal and can also make the parent go to the School Attendance Review Board (SARB.) Being SARBed is a VERY uncomfortable experience, I have been told! There is a judge that can fine parents for not sending their children to school habitually, and this includes tardies of more than thirty minutes. Parents can also serve jail time! This is the law in CA. There are many steps that are taken first that are not as punitive, but still they can be taken by the administration. Unfortunately, children are not required to be in school at all until they turn six, so until their sixth birthday, we can only talk to the parent and send them through the office to check in, and tell them what is "coming." It is generally effective enough for most. How does this all affect my routine? Well, I usually have most kids arriving on time. There may be one child per year that habitually arrives late a couple of times per week, I'm sad to say. And that one child does not interrupt my routine. He or she just joins us wherever we are at. They have missed quite a bit of instruction, unfortunately. And their achievement shows it, for sure. Those children go to school from 8:15 - 11:35, I think. So it's not even as long a day as yours, I think! You may want to consider starting your day with playtime, and telling the children that if they want to have playtime then they need to get their mommies and daddies to drop them off earlier. Then you don't have to worry about children being dropped off right on time. If the children are the ones pressuring their parents to get there early so that they can play with their friends, maybe they will get there on time?